Positive cash flow properties can be a great way to make money and achieve financial freedom but they aren’t without their faults. Here are 9 problems with positive cash flow properties. I love positive cash flow properties and they can be a great way to invest with low risk and to achieve financial freedom, but there are some problems with positive cash flow properties that you should be aware of before you decide what you want to go ahead and invest in. Hey, I’m Ryan from on-property, helping you achieve financial freedom and tell you we’re going to look at nine problems with positive cashflow property. The first problem is that they are harder to find negative geared properties are available all over Australia in every single metro market. Wherever you look, you can find negatively geared properties, but if you want to invest in positive cash flow properties, they are harder to find. You need to find an area that has a higher rental yield than average or you need to find properties with unique characteristics that generate a positive cash flow. So this might be Julie income properties, or it may be a property where you need to actually create the cashflow yourself through a building. Something like a granny flat, but yeah, negatively geared properties are available everywhere. You can have your pick of the litter positive cash flow properties a hard as a fine and they do take more research in order to find the right property. The second problem is that sometimes the properties are less desirable or less desirable areas. Generally speaking, you can often find positive cash flow properties in low socioeconomic area, so in the poorer areas of a town or a city where you’ve got government housing and things like that. Prices don’t tend to be as high, but rental yields tend to be better compared to the price of the property, so you’ve got higher rental yields in those situations which can lead to a more difficult property or a less quality property because your tenants aren’t going to be as good and you’re not in that owner occupied area. Also, you are limited in the areas that you can invest sometimes as well, so you might be restricted to regional centers. That’s a really easy place to find positive cash flow properties. Or you might be restricted to these areas of this suburb that aren’t full of owner occupiers. So this is sometimes the case. Obviously, the more research you do and the more specific you are, you can find positive cash flow properties that are in great areas, but they’re just harder to find, which goes back to step number one. Step number three is your property’s not going to be positive cash flow. If it’s not rented, most properties, you’re going to have one source of income. This is the same as having a job. You got one source of income that you’re completely reliant on, and if you’re not getting that source of income, you’re not going to be positive cashflow, so this is obviously not ideal to avoid your property been vacant. You want to buy in an area with a low vacancy rate, definitely under two percent or the lower the vacancy rate, the better to ensure that your property is going to be rented. Again, you want to do your research to find an area that’s gonna, have long term demand so your property will continually be rented as well. Other ways to mitigate this risk is to actually grow your portfolio and have multiple properties, so one property is not rented. You’ve got other positive cash flow properties that can help pay for that until it is rented. The fourth problem is that often you’ll have to actually manufacture the cashflow, so rather than going out there and buying a property and it being positive cashflow from day one, a lot of properties, you need to manufacture the cashflow and create it yourself. You can create this through things like renovations and increasing the rental yield. That way maybe you can move internal walls of a property and turn it from a three bedroom into a four bedroom property. Maybe you can build something like a granny flat and get that extra rental income coming in, or maybe you can manufacture that positive cashflow through paying down debt or through saving on things like your interest rate, but often you’ll need to actually manufacture that cash flow in order to buy in one of those high quality areas so you won’t have positive cash flow off the bat. You’ll have to actually go out and create it yourself. The fifth problem is that maintenance can lead you to have a negatively geared year, so if you have big maintenance come up on a property, maybe the roof needs to be replaced of the property. Something gets broken like your hot water heater or things go wrong. Then you’re going to have to outlay money in order to pay for that. That can easily put you in a negative leak. You’d position for the year. Now obviously you can add that new staff to your depreciation schedule, which can help come tax time. That starts to get a bit more complicated, but because of maintenance issues, you can actually be pushed into the red and we pushed it into a negatively kid situation. Generally, this can happen from time to time, but doesn’t happen every single year and the idea is that you save up. You have a savings buffer that you can use to pay for these expenses when they come up. So that might be a lump sum of money on your offset account. That’s helping you save on interest that if you have one of these big expenses, you’ve got that money there to pay for it and you build that up over a number of years. The six problem is that you can potentially lose out on capital gains. If you’re not buying in the right area, the right time of the market, then you can miss out on capital gain, so sometimes by pursuing positive cashflow you’re neglecting other opportunities that could get you better capital growth, so you might get the positive cashflow and a bit of capital growth, but you might not get as much capital growth as you could have gotten if you invested in an area or an a property that was specifically for those capital growth purposes. The sevens problem with positive cash flow property is that the prophets are subject to tax. Now, talk to your accountant about this one because you can depreciate portions of your property so this might help to offset the income that you’re making from the property. But I’m not personally accountant myself, so I can’t give you taxation advice, but speak to an accountant on this one. But negative gearing at the moment, and they are talking about removing this, but negative gearing can actually offset the tax that you earn in your regular job, positive cashflow because you’re earning extra money, you then need to pay tax on that money you earn, so that’s a problem. But then is it really a problem because you’re making extra money and that’s why you have to pay tax. So I guess this problem is in the eye of the beholder, whether you think that’s a problem or not. The AIDS problem with positive cash flow properties is that prices may be more volatile if you’re buying in somewhere like a regional center or a country town, especially prices in country towns tend to be much more volatile than those in metro markets. They can go up faster than metro markets, but they can also go down a lot faster. The metro markets as well in terms of supply and demand, it can fluctuate a lot quicker and a lot more extremely than a metro market where you’re looking at millions of people in the area, so prices can’t be more volatile. So that’s something you need to consider, and then the ninth problem is that your property may take longer to sell. If your property is positive cashflow and is geared towards investors wanting to buy it. Most of the people who are buying properties, actually homeowners, not investors. So if you’re probably doesn’t appeal to a homeowner and only appeals to investors, you may have trouble selling your property, which means you can stay on the market longer, which may mean you might not get as much money for that property as well if only investors are looking at it. So this is why when you purchase a property, you want to try and find a property that has that owner occupier appeal as well. So you’re getting the best of both worlds there. So they have it. Nine problems with positive cash flow properties. Now every investment vehicle has its pros and its cons and positive cashflow property is no different. Thanks so much for tuning in today. 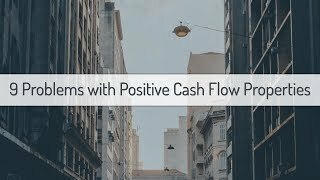 Go ahead and check out the video that I did on the advantages of positive cashflow property. Again, links will be in the description down below. Check out cash cashflow finder. See that’s for you. Until next time, stay positive.